The objective of the study was to identify potential explanatory factors for racial differences in blood pressure (BP) control. The study included 608 patients with hypertension who were either African American (50%) or white (50%) and who received primary care in Durham, NC. Baseline data were obtained from the Take Control of Your Blood pressure study and included clinical, demographic, and psychosocial variables potentially related to clinic BP measures. African Americans were more likely than whites to have inadequate baseline clinic BP control as defined as greater than or equal to 140/90 mmHg (49% versus 34%; unadjusted odds ratio [OR] 1.8; 95% confidence interval [CI] 1.3–2.5). 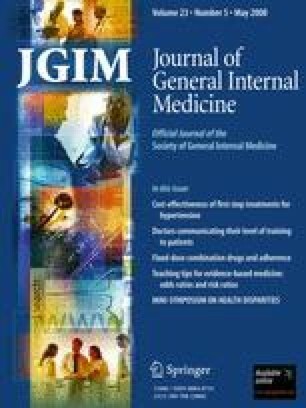 Among factors that may explain this disparity, being older, reporting hypertension medication nonadherence, reporting a hypertension diagnosis for more than 5 years, reporting high levels of stress, being worried about hypertension, and reporting an increased number of medication side effects were related to inadequate BP control. In adjusted analyses, African Americans continue to have poor BP control relative to whites; the magnitude of the association was reduced (OR = 1.5; 95% CI 1.0–2.1). Medication nonadherence, worries about hypertension, and older age (>70) continued to be related to poor BP control. In this sample of hypertensive patients, there were a number of factors associated with poor BP control that partially explained the observed racial disparity in hypertension control including age, medication nonadherence, and worry about BP. Medication nonadherence is of particular interest because it is a potentially modifiable factor that might be used to reduce the racial disparity in BP control. This research is supported by a grant from the National Heart, Lung, and Blood Institute (R01 HL070713), a grant from the Pfizer Health Literacy Communication Initiative Foundation, and an Established-Investigator award from the American Heart Association to the first author. Dr. Powers is supported through the Mentored Clinical Research Scholar Program through Duke and the NIH (KL2 RR024127). Dr. Thorpe was supported by an Office of Academic Affairs VA-funded postdoctoral fellowship.